Carl Zeiss LSM 510 inverted confocal microscope, equipped with dry, water immersion and dipping objectives and a lens inverter; Boss LM test bench system for controlled loading of biological tissues; Instron Micro Tester 5848. The Department of Biological Sciences is home to a state of the art mouse facility equipped with surgery suites, micro-computed tomography, and a fully integrated live imaging system for bioluminescence or fluorescence (IVIS) with onboard gas anesthesia. The facility includes a sterile room for housing immunocompromised mice, and a quarantine room for new animals. Additional standard animal housing is available for mice needed for OA models and injections. Equipped with an Instron Microtester with a range of load cells, LVDT’s, extensometers, specimen grips and computer-based test control and data collection; a compound microscope equipped with BioQuant Imaging system for high-resolution visualization of displacement-force testing of biomaterials and biological tissues. Custom testing devices for animal loading and tissue testing; stereomicroscopes. This is a multidisciplinary research facility (~3000 sq ft) in the Department of Health, Nutrition and Exercise Science and is dedicated to the biomechanical and sensorimotor analysis of human movement. It is equipped with 8 digital cameras (Motion Analysis), 4 AMTI force plates, 2 EMG systems (Konigsberg). The HPL also contains a custom built Stiffnesss and Proprioception Assessment Device designed for precise control and measurement of the neuromechanics involved with joint stability. 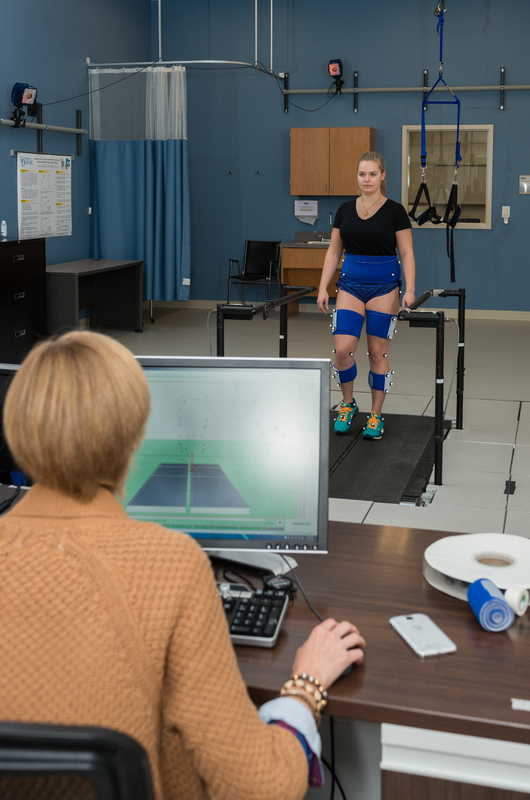 Shared equipment within the Center for Biomedical Research includes an instrumented split-belt treadmill (Bertec), 6-camera motion capture system (Motion Analysis) and 16-channel EMG system (Noraxon). To create a three-dimensional object from a solid-model computer database description, we have access to Z-Corp 3D printing technology for free-form fabrication. For academic use only. Requires orientation session with Whitney Sample. The Department of Physical Therapy houses a 2354 square foot laboratory for research in motor control, biomechanics and the Running Injury Clinic. Equipment includes a VICON motion system, Bertec force platforms, Motion Lab EMG systems and an AMTI instrumented treadmill. Other labs within the Center for Biomedical Research maintain a 7-camera motion capture system (Qualisys), floor-mounted force plate (AMTI), tethered and telemetered EMG systems (Motion Labs), Biodex dynamometer and Asumi 5000 ultrasound unit.